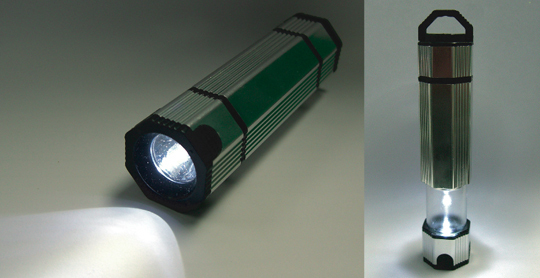 it uses 2 candles to power a small bulb, pretty powerful. your flashlight, then when you run out of power, light your candles. 1: It is impossible to make a current source out of 2 balls of wax. 2: In a battery there must be A: a source of electrons, and B: a drain for electrons. Meaning: u must hook up BOTH the positive and negative of the battery. 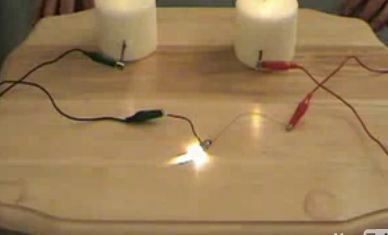 His demonstration is like simply hooking up a bulb between the positive of 1 battery, and the negative of another battery. Also, thats assuming it is even possible to wax and a nail to form a voltaic process. 3: Now lets again assume that all that works……what difference would if make if the candle was lit or not? I see no way a flame could somehow create electrical energy to be transmitted down the wick, through wax, into a nail, and through a bulb. 4: To magnetize a nail, u must rub a STRONG magnet (judging by the magnets i used to play with back in grade school that looked like that, or the ones on my refrigerator, they are not very strong). You must rub the magnet repeatedly, in ONE direction to multiply the force, going back and forth will just cancel out the effect of the previous swipe. 5: Lets say the nail really became magnetized…..what would that have anything to do with how its being (or supposedly being) used? 6: AND FINALLY: Notice how whenever the device (ie: bulb/motor) is turned on or off, one of his hands remains unseen under the table….and is it really necessary to swap the lighter into the other hand, to light a candle thats just 8 inches apart? All im trying to say is, dont waste ur time trying it. He obviously rigged up a battery and switch of some sort underneath the table, and ran the wires through the table or behind the candles and onto the nails. For that alone, i will give u credit for going through that trouble just to make a spoof….but cant ya just make it a little more believable next time? Anywho, thats just my 2 cents. No hard feelings. hmmm… yes we are going to confirm that this works by making it ourselves too so watch out! However, notice that each time before he lights the second candle, his free hand is under the table. This is so that he can turn on the power source under the table. Also, notice that by time 1:50 the center portion of the red wire and the center portion of the black wire are now off the table. This is where they are connected to a battery under the table. Very clever I must admit, but alas, case solved. Ok, look here. I belive him. Take note. THE WIRES on each side MUST cross on each side. Can we make Energy from water? Then for sure we can from fire! Did again from Viktor Shauberger. ANd here Again In MIT with Walter Levin lessons… Shut Up! Sit Down and Do-youself before any word! Oh thanks for the fire video, will post it! Where buy these candles?, Any nails sise? Any Candle Sise? Color? Aromatic? Any wire sise? Any aligator? Temperature there? Is under or above 0 graus celsuis? The pollution on atmosphere? Where it is? Kansas, NY, Brasil? Im going to do that! 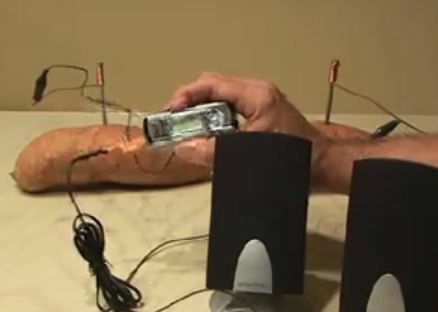 If your video was a fake, I will show the truth about alternative heat power energy from dieletric or non condutive sources! 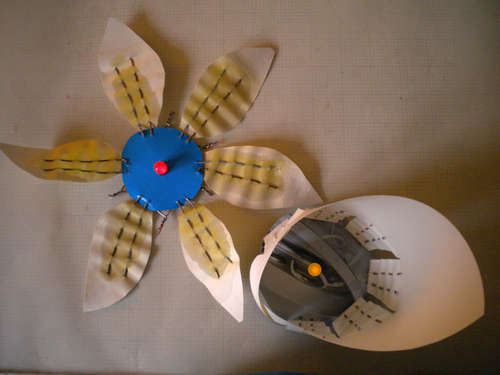 Check out more interesting categories: Circuits, DIY, Educational, Entertainment, Misc, Video. 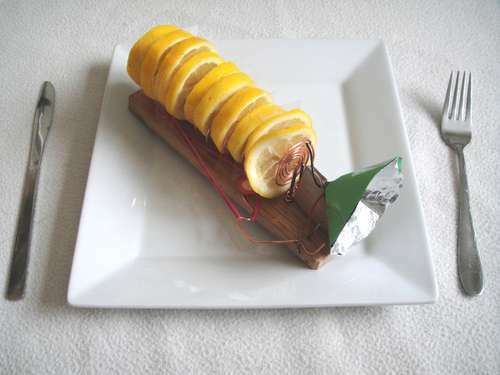 Battery DIY – How to Make Lemon-Powered Flashlight! Candle DIY – How to Make Custom Candles!